Eating a vegetarian or vegan diet should never hold you back from enjoying flavorful classic recipes. General Tso’s is traditionally made with meat, but we have recreated this recipe as a vegetarian meal! 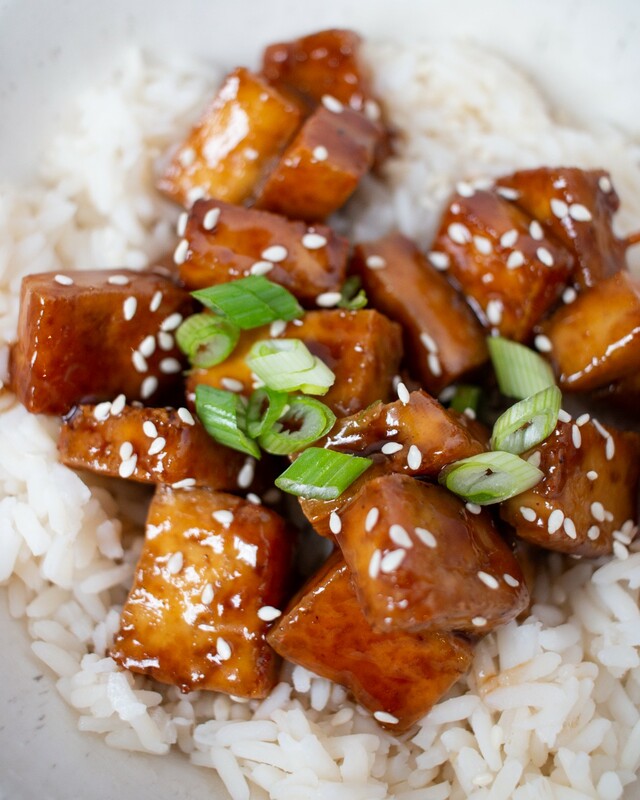 Tofu is a great food to use as a substitute for meat dishes. It is rich in protein and contains all nine essential amino acids, which help your body process protein. Tofu also provides your body with iron, calcium, a number of important minerals, and vitamin B1. This General Tso’s sauce is made with our CBD Superfood Coconut Oil, so a bowl of this goodness also carries all the possible benefits of CBD to keep you feeling nourished, strong, and soothed! Press tofu block. Slice tofu into small rectangles. In a small bowl, mix almond flour, salt and pepper. Coat each tofu slice and place on a plate. Freeze for 20 minutes. Cook rice on the stove. While rice is cooking, heat canola oil in a sauté pan. Once the oil is hot enough, use tongs to place tofu pieces into oil. Fry for 10–15 minutes, or until each side is brown and crispy. Remove from oil and place on paper towel to absorb excess oil. In a separate sauté pan, combine teriyaki sauce and maple syrup and cook for 5 minutes until reduced. Remove from heat and add CBD Superfood Coconut Oil. Put fried tofu in the pan and coat in the teriyaki sauce. Put one cup of rice in a bowl. Top with tofu and sauce. Sprinkle scallions and sesame seeds for garnish, and enjoy!